After throwing on a Mexican Wrestler Mask to DJ for WOW Women of Wrestling last year in Long Beach- DJ Pasha was asked to return! This time for the full taping of the promotions Season 5 at the beautiful Belasco Theatre downtown Los Angeles. With Dangerous DJ Pasha reserved, he organized a complete walk through and sound check at the Belasco prior. With his experience he made many suggestions into production and his placement. See we don’t look at our bookings to be as simple as playing music-we are performers. With that DJ Pasha wanted to be seen in costume, heard by the entire arena, and interact with every fan. The night of DJ Pasha arrived 5 hours before show time to ensure all went smooth. Dressed in a white tuxedo and matching Luchador mask, even the staff wondered who this mysterious character was! From his first song the energy burst to the ceiling and wall to wall. By doing his own research DJ Pasha was able to promote the media, matches, and merchandise all by pumping up the crowd. 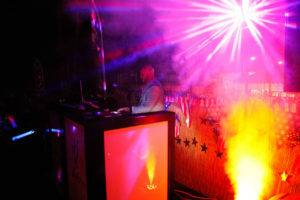 As the event was about to begin, DJ Pasha had everyone on their feet and dancing in anticipation. With over 12 matches and Dangerous DJ Pasha in the mix the theatre was electric. We have already been asked to have Dangerous DJ Pasha back for the Season 6 event! With every performance we supply the energy and excitement for your event’s success!